Joann Morral, 84, formerly of Bridgewater, passed away Tuesday, January 15, 2019 at Sentara RMH Medical Center. She was born in Pendleton County, WV on August 3, 1934, a daughter of the late Gae Alta Arbogast and Harry Morral. Joann worked for Friendship Industries for many years. 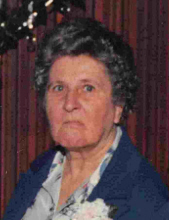 She is survived by her daughter, Robyn Kay Gibson, of Dayton; two sons, Timothy Michael Morral, of Rockingham, and Anthony Scott Morral and wife Carol, of Mount Crawford; three grandchildren, Adam Morral and wife Stephanie, Stephanie Weaver and husband Brian, and Zachary Gibson; three great grandchildren, Katelyn Morral, Symphony Brennan, and Trinity Brennan. She was preceded in death by her brother, Jerry Paul Arbogast. A memorial service will be held at 6:00 PM on Friday, January 18, 2019 at Johnson Funeral Service Chapel in Bridgewater with Pastor Gregg Adamson officiating. The family will receive friends following the memorial service. In lieu of flowers, memorial contributions may be made to Rockingham Harrisonburg SPCA, PO Box 413, Harrisonburg, VA 22803. To send flowers or a remembrance gift to the family of Joann Morral, please visit our Tribute Store. Pastor Gregg Adamson officiating. The family will receive friends following the memorial service. "Email Address" would like to share the life celebration of Joann Morral. Click on the "link" to go to share a favorite memory or leave a condolence message for the family.